Debuted at ISE 2016, Shure’s newest solution to the conferencing microphone system comes in two forms: a 360-degree roundtable mount solution, and an overhead ceiling array solution that can be flush mounted, pole mounted, or suspended. The Microflex table array microphone offers steerable coverage technology that can direct to a speaker in up to four areas in 15-degree increments. The Microflex ceiling array model captures up to eight independent voices through an overhead microphone, and can be easily preset with templates and polar patterns. “Shure has an expertise in microphones, acoustics, and digital signal processing, and we wanted to create a series of intelligent networked mics that has never existed before,” said Rob Klegon, associate product manager, Shure Networked Systems Group. One of the most important aspects when designing this new series, Klegon said, was making sure that it was easy to use and configure for any situation. “People want to get work done without having to worry about technology,” he said. The Microflex table array microphone offers steerable coverage technology that can direct to a speaker in up to four areas in 15-degree increments. 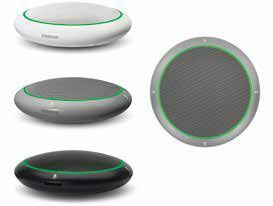 Users can specify polar patterns for each configuration including cardioid, supercardioid, hypercardioid, omnidirectional, bi-directional, and a patent-pending toroid pattern that is designed to enhance the voices of those speaking and eliminate white noise within the room. Both models come with flexible networking through discrete channels on a Dante network over a single ethernet cable, and digital signal processing through Shure’s new Intellimix DSP Suite. Intellimix allows users to easily steer coverage to capture voices in any location within the room. The software also offers preconfigured templates to simplify setup. To help increase presence and reduce noise pickup, Intellimix also applies automatic mixing, improving clarity and intelligibility. Both array microphones feature browser-based tools that make it easier to remotely monitor and control the microphones, configure capture areas, and set polar patterns.